Frozen fish is a regular item on my weekly grocery list. Sometimes, I’ll switch to shrimp or giant scallops. I’ve been making scallops in the last few weeks because I wanted to practice how NOT to overcook them. Just like vegetables, seafood is a must-have item and I don’t mind if they’re frozen. With the right herbs and spices, they can be transformed into appetizing and delicious meals. My taste buds are a little uncivilized; they can’t distinguish between fresh and frozen especially when it comes to fish. I had a pack of frozen cod and was wondering what to do with it. 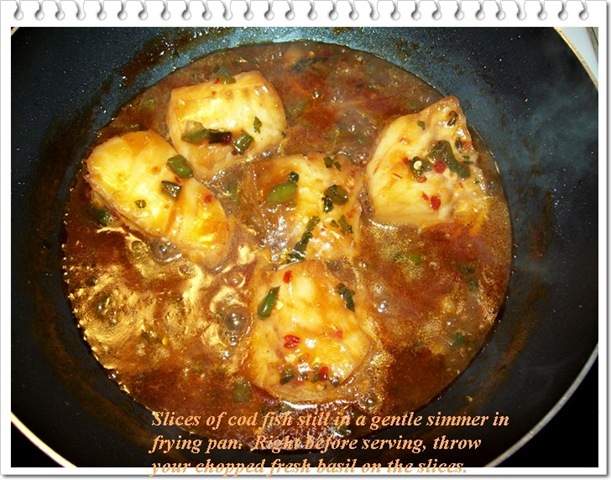 I had cooked fish in a variety of ways but wanted to try a different dish this time. Then I remembered. More than a decade ago, during a visit to my sister, she served fish with chopped fresh basil. I love basil, but the sauce gave me a jolt. My mouth came alive with the subtle sugary taste combined with hot and spice. 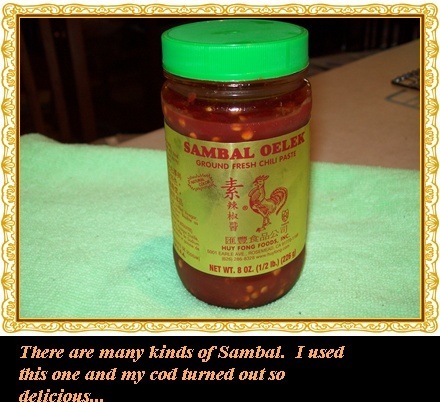 When I returned to Montreal, I checked if our Oriental store had Sambal so I could make the recipe. I found it and was surprised that there isn’t just one Sambal, but many. Curious, I googled Sambal. I learned that it’s a flavoring (or condiment) that is used in countries like South India, Singapore, Malaysia and Southern Philippines. Red hot chili peppers are the main ingredient. I understand from Wikipedia that in Indonesia alone, there are at least a dozen varieties of Sambal. Frequent tasting of the sauce is important once you’ve added the Sambal. The oyster sauce needs to be combined with some water; otherwise you’ll end up with a very strong taste. 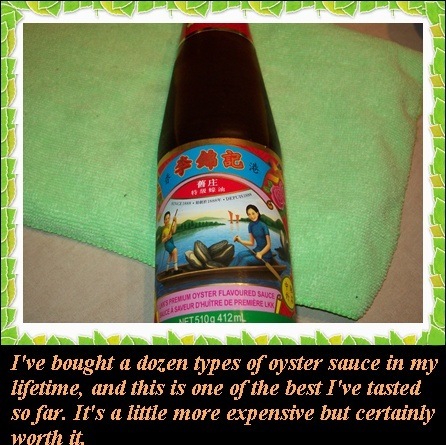 I used to buy cheap oyster sauce ($3.00), thinking that oyster sauce is oyster sauce no matter how much it costs. I’ve changed my mind since. Now I know that a good quality oyster sauce makes a world of difference in taste. I bought this one from the LKK company (almost $6.00). It is made in the US (note: I wasn’t asked to endorse this product by the company, by the way. I just think it’s one of the better ones in the market). Choose thick slices of frozen fish. Thin slices could break during the cooking process. You can always use fresh if you want. Adjust the spiciness by adding more sugar or water. I like my sauce to be hot and spicy; my brother-in-law likes them very hot and very spicy. To him, it isn’t spicy enough if he doesn’t break out into a sweat (I think he spent too much time in Thailand)! 10 tbsp of sugar (adding less sugar or more sugar is entirely up to you. See my tip above. You need to keep tasting the sauce to decide how spicy you want it. If it’s too spicy, add more sugar gradually by tablespoons). Heat the oil in your frying pan and then sauté the green pepper for about a minute. Add your oyster sauce that you diluted with water (the idea is not to end up with a very thick consistency. The water removes the sauce’s thickness and also neutralizes the strong taste of oyster sauce). Reduce heat to medium. Add your fish slices. Let the fish and sauce boil gently. Put the 2 tbsp of Sambal Oelek at this point. After 2-3 minutes, turn the fish slices to cook the other side. This is where you need to start tasting the sauce so you can decide how much sugar you need to add after putting in the 10 tbsp. I’ll repeat myself: the degree of spiciness is an entirely personal choice. If you don’t like the idea of putting too much sugar, you can also add more water to eliminate some of the hot taste. Right before serving, sprinkle with basil. Serve with steamed rice and a green salad (or grated celery root in mayonnaise and mustard would make a perfect combination).